Governments are increasingly making use of field experiments to evaluate policy interventions in the spheres of education, public health and welfare. 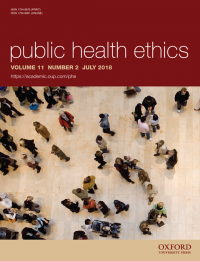 However, the research ethics literature is largely focused on the clinical context, leaving investigators, institutional review boards and government agencies with few resources to draw on to address the ethical questions they face regarding such experiments. In this article, we aim to help address this problem, investigating the conditions under which informed consent is required for ethical policy research conducted or authorized by government. We argue that investigators need not secure participants’ informed consent when conducting government policy experiments if: (i) the government institution conducting or authorizing the experiment possesses a right to rule over the spheres of policy targeted by the research; and (ii) data collection does not involve the violation of participants’ autonomy rights.